We are an innovative, family owned, national company with four generations of experience. Using only the very finest ingredients, the Smallholder Range provides well-balanced feeds designed for animals being raised more naturally. 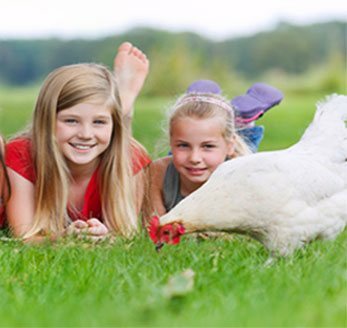 We pride ourselves on making natural feed without, artificial growth promoters or artificial yolk pigmenters. Our mill is totally drug free - no antibiotics, cocciostats or growth promoters. All feeds in the Smallholder Range are Vegan approved by the Vegetarian Society, meaning that there are no animal by-products in any of the ingredients. We only select the highest quality oils and our products are formulated without genetically modified ingredients. "In April 1997, I was given some fertile duck eggs of mixed breeds (mainly apple yards) from a small holding in Devon. When incubated, 14 hatched and were raised on Starter Crumbs. I kept five ducks and a drake, of these three ducks survived and two are still laying after starting again last month - about three eggs a week. They enjoy the run of our large back garden (the hens have a separate run) and their favourite occupation is poking their beaks into the grass finding many delicacys, especially during the wet weather." "I recently bought my first micropigs, Agatha and Barnaby and after doing a lot of research on foods, settled on Allen and Page Potbellied Pig Food. I’m a vet so I know how important nutrition is to an animal’s overall health so was really keen to make sure I was feeding them a good quality diet. Agatha and Barnaby are thriving on it. Their skin and coat is in really good condition and they are maintaining a lovely weight and are well muscled. I’m really pleased how well they are doing and would recommend Allen and Page to other mini pig owners!" "I use the Super Mixed Corn on a daily basis as a treat as it is ideal for the Game birds. The grit and limestone help as a calcium supplement and with digestion in the gizzard grinding process, but most importantly the split peas which are a crude protein source of 24.5% which complement the other two grains perfectly." What should I feed my chicks to ensure they get all the nutrition they need? Feed for other animals ? content of www.smallholderfeed.co.uk 2018 - all rights reserved.